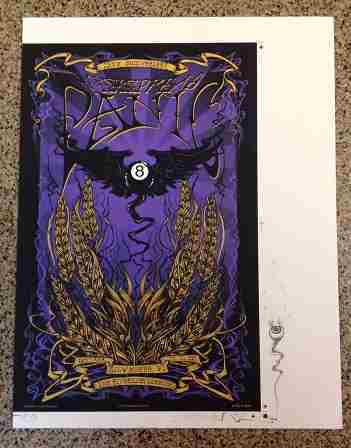 This is an uncut artist proof for the 2011 Widespread Panic Milwaukee concerts at the Riverside Theatre. Designed by poster artist Richard Biffle, this print is signed and numbered out of 30 by him. There is also a cool looking doodle that was hand drawn by Richard when he signed this uncut artist proof. No tears, bends, or creases. Slight edge wear Approximate size is 20" x 26". We can email you more pictures, so you can see it up close if needed.